Apricot trees are wonderful fruit trees that require a bit of care to produce beautiful apricots, but they are easy to grow. Planting, pruning and caring for them is important to avoid diseases and ensure proper development for your apricot tree. Best is to plant your apricot tree in fall, with a distance of about 5 feet (1.5 meters) between trees if you are planting several. 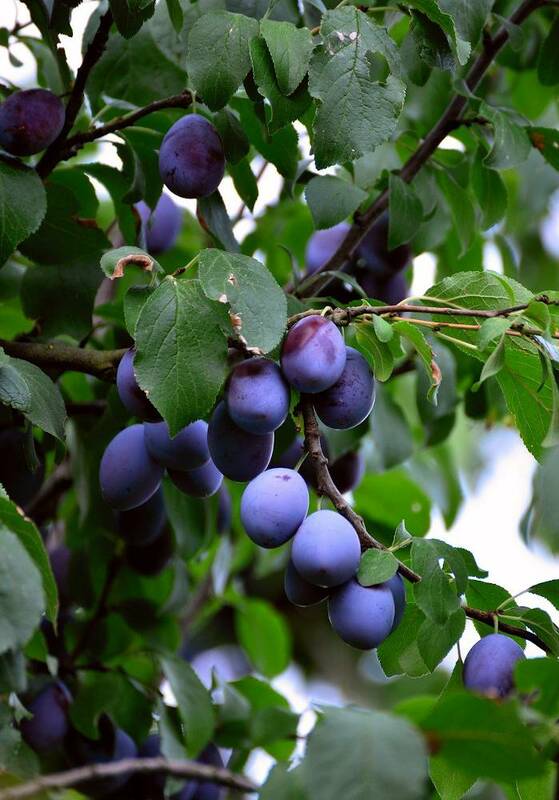 You can also plant your apricot tree in spring or summer but provide for regular watering at the beginning. Apricot trees require sun to flower correctly. 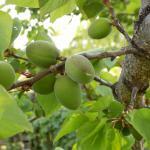 Rich and well-drained soil will increase apricot harvest. 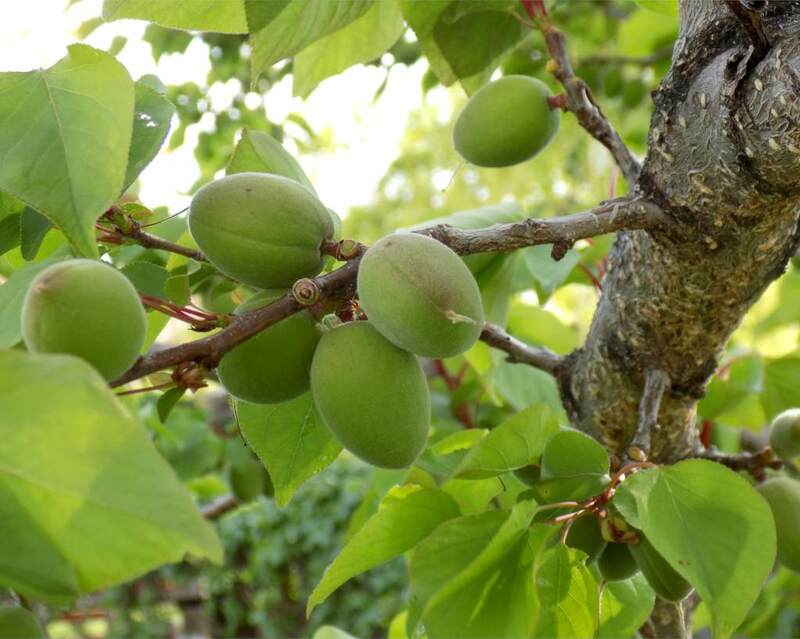 Apricot trees don’t do well in waterlogged and excessively moist soil. It is much better to plant in a location that is sheltered from strong wind. Refer to our guidelines for planting. Be careful! Flowers die off in below freezing temperatures, so if you expect late frost spells in your area, choose later-blooming varieties such as the Prunus armeniaca ‘Polish’ variety. Easy to care for, an apricot tree only requires little attention when it is correctly settled in. To avoid diseases, a simple treatment at the end of winter helps protect your apricot tree from a great number of fungus. After the blooming, spray Bordeaux mixture, which is particularly effective in stopping apricot fruit rot, called European brown rot. 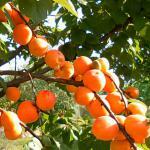 In spring, bury 1 or 2 handfuls of fruit tree fertilizer at the foot of the apricot tree. In fall, spread compost or even manure at the base of the tree. Like most fruit trees, apricot trees are vulnerable to multiple diseases and parasites that can go all the way to ruining an apricot harvest. If treated well, and especially if treated in a timely manner, it is possible to avoid apricot tree diseases and fungus. The first weakness to watch out for is spring freezing that can devastate a harvest. It is mandatory to plant in the sun and out of strong winds to mitigate this risk. European brown rot – This is the most common apricot tree disease. Apricots literally rot while still on the apricot tree, with brown bruises and white spots appearing. Here is how to fend off European brown rot. Powdery mildew – Young apricot fruits are colonized by this fungus, and a layer of whitish velvet and white spots appear. Here is how to fend off powdery mildew. Aphids – These are the most common apricot tree parasites. Here is how to fight aphids off. Regular spraying of Bordeaux mixture, as soon as buds open and up to about two weeks before harvesting the apricots is a sure way to avoid many fungal diseases. A beautiful summer harvest can then be expected. Annual pruning is recommended to increase the harvest. Pruning is generally performed in spring or fall, as long as it doesn’t freeze. The goal is only to even out and balance the tree’s growth. Increase air circulation by removing weak branches and favoring outwards-growing branches. In order to coax the tree into producing many beautiful apricots, it is possible to perform a fruit-inducing pruning before spring growth resumes. As soon as leaves have fallen off, the tree is pruned to slightly reduce the branches that have born fruits, and weak and damaged branches are removed. 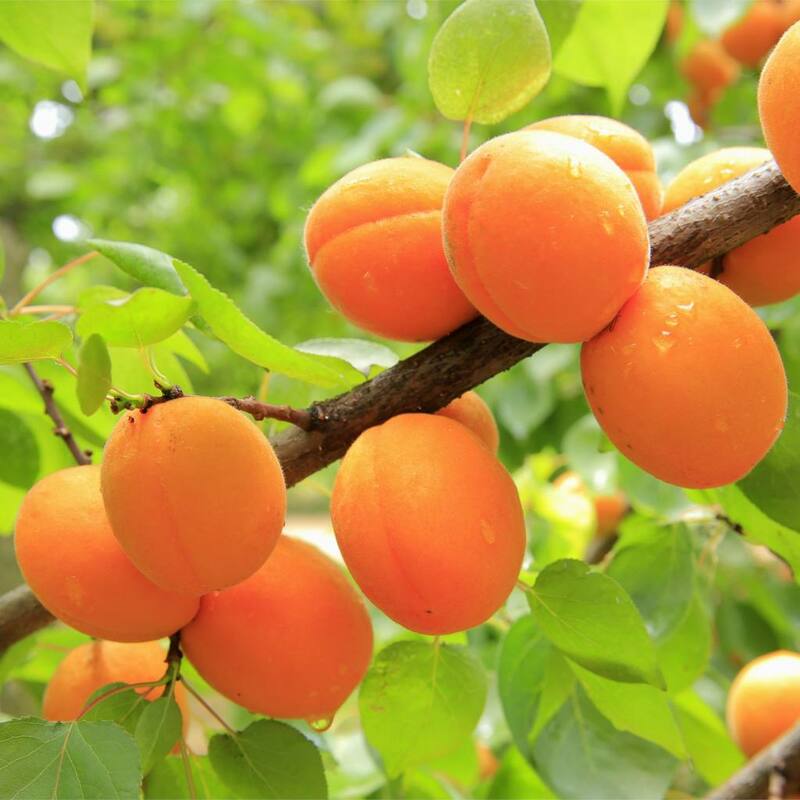 Apricot trees are very vulnerable to wounds, and it is a good idea to apply wound-healing paste after pruning. 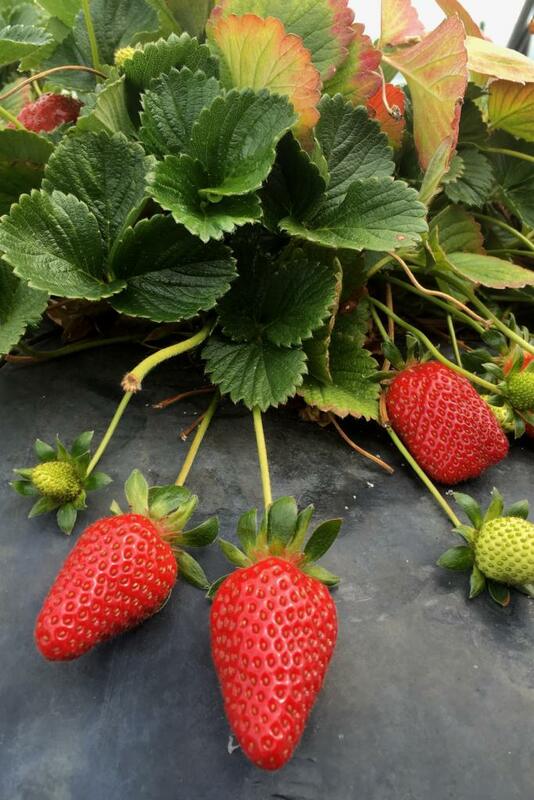 In case of of abundant production, feel free to thin the fruits in spring, simply removing a few fruits. If a branch breaks, cut it off cleanly near the wound and apply pruning paste. 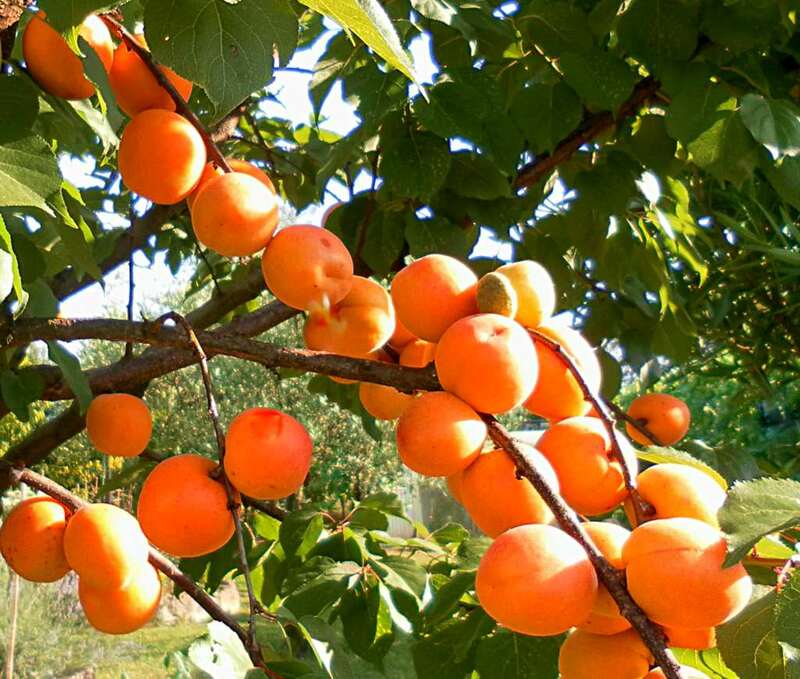 ‘Bergarouge’ – Red colored, sweet and juicy large apricot, harvested from mid-July onwards. ‘Bergeron’ – Yellow colored, juicy and harvested in August. This variety is very hardy. ‘Hargrand’ – Yellow colored, perfect for jams. Harvested mid-July. ‘Luizet’ – Cute, mottled apricot that is particularly juicy, harvested mid-July. ‘Muscat’ – Yellow colored, a heirloom variety that is particularly tasty, harvested from mid-July. ‘Orangered’ – Red colored, is one of the early varieties, first to be harvested. It is crisp. ‘Gros Peche de Nancy’ – Yellow colored, large musk-flavored fruits harvested end of July to beginning of August. 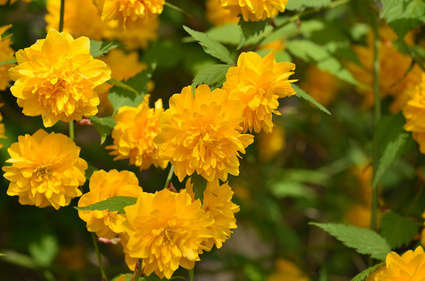 ‘Pointu de roquevaire’ – Yellow colored, very fragrant and recognizable thanks to its distinctive pointed end, it is harvested from July onwards. ‘Polonais’ or ‘Polish’– Yellow colored, perfect for making your own jam, harvested from beginning of July. ‘Rosé de Provence’ – Red colored, very sweet and harvested from early July. ‘Rouge de Roussillon’ – Red colored, particularly fragrant and harvested from early July. ‘Tardif de Tain’ – Orange-yellow colored, late variety harvested end of August. Apricot trees are also called common apricot trees (Prunus armeniaca). It belongs to the Prunus genus and to the large Rosaceae family. Native to Asia, it likes heat, and depending on the location and the variety, produces apricots from June for the earlier ones up to August for the later ones. Artifacts prove that it was grown in ancient China over 2000 years ago. Very productive in terms of fruits and flowers, this little tree has many assets, be it in spring with its magnificent pinkish white flowers, or in summer with its orange yellow apricots. Most apricot tree cultivars are self-pollinating. Easy to care for, apricot trees like rather hot and wind-sheltered areas and are simple to grow. Apricot trees are vulnerable to the same diseases as those attacking peach trees, specifically peach leaf curl and also European brown rot. No point in watering often, since this tree resists short droughts very well.